While we’ve been working hard to build the best proposal software, AffinityLive has built an awesome platform to do almost everything else. 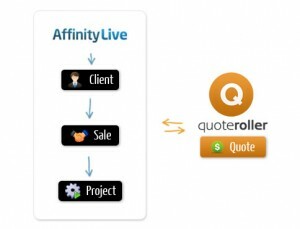 With CRM, Projects, Support, Timesheets & Invoicing in one system, AffinityLive now integrateswith QuoteRoller too! AffinityLive’s system automates all the work you do in a service company, from prospect to payment, and everything in between, in a single, easy to use, online system. And while we have made it incredibly easy to create and send beautiful proposals, AffinityLive is making it easier than ever to manage all of the other client work you do in your business, saving you time and increasing your revenue by ensuring you get paid for the work you’re already doing. Before you’ve created a quote….. It can sometimes take a long time to turn a lead into someone who’s ready for a proposal. And even if it doesn’t, they’re still just a prospect until they have accepted your quote, so you still need to have a place to keep track of your leads, activity and opportunities. AffinityLive gives you all the normal CRM features and more – you can in addition to a database for contact info and notes, AffinityLive also automatically captures all of the emails you send to clients and receive back from them, making it easy for your whole team to keep coordinated. It also syncs with your Google Apps or Microsoft Exchange calendar and address book, and when you create a quote in Quote Roller, the client contact details are already sync’ed across from AffinityLive. – AffinityLive’s automatic e-mail capture can automatically capture and store e-mails in the system against their associated account. – Best of all, since it’s a hosted system, your or your team can access this information from anywhere you have an internet connection, from any device. And rights management controls allows you to keep sensitive information private. – Their automatic time sheets make this grueling process a breeze. With recording time directly against a project, while AffinityLive takes care of the rest. Though we can’t tell you every way AffinityLive can help you grow your business (there just isn’t enough time), we do encourage you to go to their site for yourself, www.AffinityLive.com, and have a look around for yourself. They have a risk free, 30 day trial too, so what are you waiting for? learn more at www.affinitylive.com!